Many people may think that all fats are bad, however, research has shown that a class of fats is extremely beneficial for our body, and they are the polyunsaturated omega-3 fatty acids. They help promote nerve growth and brain development, and they also help prevent heart diseases. Omega-3 fatty acids are easily available as health supplements, but what is the best time to take them? Most experts recommend that omega-3 supplements should be taken with a meal, ideally during dinner. Here are the reasons. Taking the supplement with a meal means that it is more likely to be tolerated by the body. The enzymes released during digestion, particularly pancreatic lipase, help in the breakdown and absorption of the omega-3 fatty acids. This means that the dose will be utilized most efficiently. Omega-3 fatty acids are recommended to be taken at night because they reach their highest plasma concentration after 12 hours, which is in the morning if you take the supplement with dinner. And heart failure is more likely to happen in the morning. Thus, a night time dose ensures that the supplement is at its peak concentration when the body needs it most. 1. How Much Omega-3 per Day? Now we know that the best time to take omega-3 is during dinner, and then you may wonder how much omega-3 per day is the best. 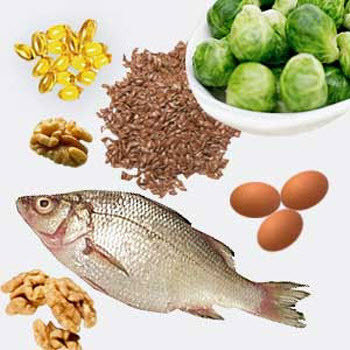 The amount of omega-3 fatty acids that a person should take daily varies on their health conditions. Generally, a healthy individual should consume a minimum of 500 milligrams of EPA and DHA in addition to 2 grams of ALA per day (EPA, DHA, and ALA are variations of omega-3 fatty acids). You can eat fatty fish, green leafy vegetables, seeds, nuts and oils which are rich in omega-3 fatty acids, or you can take supplements. People with elevated triglyceride levels: 1000-4000 mg of EPA and DHA per day. The correct method here is to start at 1000 mg per day and keep increasing the dose until the triglyceride levels come back to the normal range. This process should be monitored by a physician. Vegans and vegetarians: 4 grams of ALA add an addition of algae-based DHA to the diet. Vegans and vegetarians have a particularly hard time in reaching their ideal omega-3 fatty acids intake, since most of the foods rich in it are off their menu. Pregnant and breastfeeding women: 500 mg of EPA and DHA with at least 250 mg of DHA. The importance of taking adequate omega-3 fatty acids during pregnancy cannot be overstated. Fish, as the best food source in this micronutrient, are notorious for carrying contaminants which can be particularly damaging to the mother and her developing baby. So care must be taken to choose the right kind of fish to eat. A lot of people just choose supplements as the easier and more controllable option. Children (younger than 18 years) and infants: A lot of infant formulas contain ALA and DHA, and young children should be fed with fatty fish twice a week. Any supplements should only be started after consulting a pediatrician. Now you know the best time to take omega-3, and how much you should take. It is also important to know that while omega-3 fatty acids can be well tolerated by an overwhelmingly large majority of people, there are some groups that need to be careful with them. People prone to allergies: People who are allergic to fish, nuts or seeds need to avoid all omega-3 supplements that are derived from them. People with bleeding disorders: People with bleeding disorders need to consult a physician before taking an omega-3 supplement and should never take more than a small dose daily. People with diabetes or hypoglycemia: Large doses of omega-3 fatty acids can affect blood sugar levels, so diabetics need to be careful about its supplement. People with abnormal heart rhythms or after a heart transplant: Omega-3 fatty acids can affect the heart rate, so patients with arrhythmias or heart transplant need to be very careful. People with hormone imbalance: Caution is advised to this group of people in taking omega-3 supplements as omega-3 may worsen the situation. People with liver disease: Even if you know the best time to take omega-3, if you suffer from a chronic liver disease or are on other hepatotoxic drugs, you should be careful with omega-3 supplements since they aslo have been found to affect liver function when ingested over a long period of time.